The season for outdoor cooking is upon us. Warmer weather means that many people are firing up the grill or smoker to cook their food outdoors. These methods make for tasty food with a flavor that you just can’t get from cooking indoors on the stove. For those who are unfamiliar with smoking and grilling, the terms may be difficult to differentiate. Both methods involve using outdoor equipment to cook food, but there are some key differences between smoking and grilling. Lastly, we have the term barbecuing, which is often used interchangeably with grilling depending on the region in which you live. The following information can help understand the difference between the three terms. 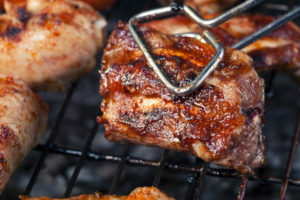 One of the main differences in barbecuing, smoking, and grilling are the temperatures that are used and the equipment needed to perform the type of cooking. When it comes to cooking temperature, the following is a quick guide to get your started with the basics. – Smoking is done at low temperatures from around 68 – 176 degrees Fahrenheit. The cook time for these low temperatures is significantly longer than from grilling. – Grilling is done at high temperatures, from around 400-550 degrees Fahrenheit, and food is usually done in a matter of minutes at these high temperatures. – Barbecuing is done at various temperatures depending on the region you’re in. The term has different regional meanings. In some areas it means cooking at high temperatures like grilling, in other areas it means cooking low and slow like smoking. In simple terms, direct grilling is when the meat (food) is placed and cooked directly over the heat source (fire/flame). This is a “high heat” method used to cook rather small pieces or chunks of food relatively quickly. These foods are typically chops, fish fillets, vegetables, chicken breasts, steaks and sometimes bread. Indirect grilling is really for cooking larger and/or tougher foods that might burn if too close to the flame (direct grilled). Basically the food (meat) is placed next to, close by or above the flame but not directly over the flame. The heat in the box or smoker will heat up and naturally cook the food over few to several hours without burning. Usually the indirect heat temperature is between 250 – 350 degrees depending on the food being indirectly cooked. Also by doing this, you are able to utilize the full flavor of wood smoke. This technique can be used to cook ribs, whole chickens and turkeys, pork shoulders and other large pieces of food. You might find a different definition of Direct and Indirect Grilling at barbecuebible.com in their recipe blogs. Grilling can be done with just the basics. There are different types of grills available at many different price points. Charcoal grills and gas grills can both be purchased at you local hardware store, big box store, or online. They come in many sizes and configurations. Whether you choose charcoal or gas is purely personal preference. With a gas grill you’ll need the grill and propane tank. 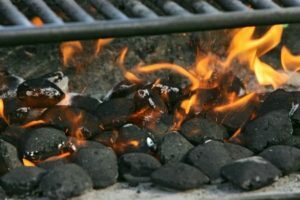 For charcoal grilling, you need your grill, lighting materials, and charcoal briquettes. You’ll also need a few basic grilling utensils like tongs and spatulas. Metal utensils are ideal because they don’t melt and can handle the high temperatures. You can also cook with cast iron griddles and pans on your grill as they can easily handle the high temperatures and will diversify your grilling options. The cheapest grills are usually the charcoal grills and many people prefer these over gas grills as they give food a more authentic grilled flavor. They are also very popular with tailgating and camping as they’re usually smaller, more lightweight, and easy to move around. The problem with using charcoal is the learning curve that comes with it. Lighting a charcoal grill can be challenging as there are several steps involved. Then you have to know when the coals are the right temperature for cooking your food. Many grilling enthusiasts swear by charcoal grills because of the taste of the food, but those who prefer a simpler method may be better off with a gas grill. A gas grill uses a small propane tank to keep the fire going. Most gas grills come with an igniter button that makes lighting the grill easy for even a grilling novice. Large gas grills also have a thermostat to let you know the temperature inside the grill, helping to know when to put the food on for the best sear. 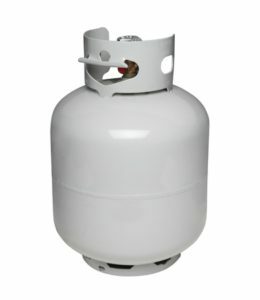 Some gas grills also have one or more burners on the side similar to that on a stove where you can heat up other foods in a pot. Some grills also have a smaller rack inside the lid above the grill grates that allows you to heat foods without actually putting them directly on the heat. This rack can be used for vegetables or even warmed buns for burgers. Gas grills can be purchased for under $100, but they can also run much higher than that depending on the size of grill and its features. Large capacity grills can easily allow you to cook your entire meal at once. Grilling is the most versatile way to cook outdoors. Nearly anything can be grilled if you have a bit of cooking knowledge and know how to use your grill. Grilling enthusiasts grill everything from burgers and steaks, to fruit and other sweets. You can literally cook your entire meal on the grill, which means less cleanup in the kitchen when dinner is over. Once you learn the basics of grilling and have knowledge of the best temperatures to cook different foods, you can grill favorites like pizza, quesadillas, and sandwiches. You can even make s’mores on the grill and grill up the summertime fruit like fresh peaches and watermelon. Foil packets can be used for grilled items like vegetables, potatoes and other side dishes. With grilling, you’re only limited to your imagination when it comes to preparing summer meals. Another huge benefit of gas grilling is that it’s much easier to control the temperature of your gas grill using the knobs, leading to food that is cooked as intended. Grilling is the preferred method of cooking outdoors for many people because it allows you to cook with less fat while still giving the food plenty of flavor. But there are some negatives to using a grill. When you’re grilling at such high temperatures, the food must be tended to and turned to prevent burning. Another negative part of using a charcoal grill is that it can be very difficult to start for people who have no experience with them. Smoking is an old technique that was originally used for food preservation before refrigeration. Meats could be smoked and kept for future use. Today, we used smoking as a way to impart flavor in different kinds of meats. When you’re eating smoked meat like brisket and pork, which is usually called BBQ in the South, the key way to tell if many types of meat have been properly smoked is the pink ring inside the meat. You can also smoke sausage, chicken, and even fish. Smoking meat leads to a unique flavor that can’t be recreated with other types of cooking. Food is slowly smoked with low-burning wood or coals for hours or even overnight. Smokers can vary greatly in size and price. But they’re often less costly than a large gas grill. For those who wish to smoke and grill different foods, there are smoker/grill combinations that can save space and allow you to have options when it comes to preparing your food outdoors. When smoking, you have the choice of many different smoking materials depending on the flavor you want in your food. Different woods give off different flavors with some of the favorites being apple wood and hickory. There are two basic methods of smoking. Cold smoking, which uses temperatures of between 68-86 degrees Fahrenheit, and hot smoking which cooks food at temperatures between 126-176. 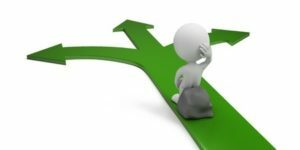 These two methods of smoking are used for very different purposes and they product different end results. Cold smoking is most often used to give flavor to different meats and cheeses. This method doesn’t actually fully cook the food but prepares it for future use. Cold smoked foods like sausage, chicken, and other meats must be cured and preserved or cooked in some other way before being consumed. Hot smoking cooks foods completely so they can be eaten once the smoking process is completed. Hot smoking is often used for hams and other large cuts of meat like ribs and brisket. 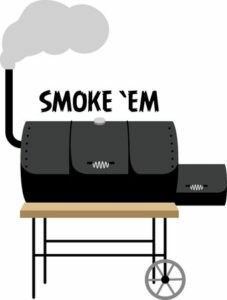 Those who love smoked food will tell you that smoking is the way to go. Smoking is like an art form to enthusiasts and they like trying out different types of wood, different techniques, and different smoking times to get that perfect cut of meat at the end. The flavor of smoked meat really can’t be duplicated with any other cooking method. Smoking can also be used to preserve foods once you learn the process. Smoking meat requires less attention and the food usually doesn’t need to be turned or tended to very often while it’s cooking. Plus, if you have a large capacity smoker, you can even smoke your Thanksgiving turkey for an amazing holiday meal. Smoking food takes a lot of time, hours or even overnight, depending on what you’re cooking. Charcoal and wood smokers need infrequent attention during the process to keep the temperature at the ideal level. Plus, without temperature knobs, it can be difficult to control the temperature of your smoker which can result in unevenly cooked food. One of the main concerns of smoking is food safety. This is especially true of those who aren’t experienced with the process. A meat thermometer can be used to ensure that your smoked foods are fully cooked. If you’re anywhere in the South, barbecue is a type of smoked meat often covered with a tangy sauce. Different regions have different types of sauces. Memphis-style BBQ has a thick tomato-based sauce with some sweetness whereas North Carolina BBQ sauce is vinegar-based, spicier, and thinner. Texas has it’s own version of BBQ sauce, as does Kansas City and other regions. Where this often gets confusing is that many people in other parts of the nation, anywhere that’s not part of the South, use the terms barbecuing and grilling interchangeably. You’re not likely to find someone in Tennessee who uses the grill to cook their steak and calls is barbecuing, but if you’re in a state like New York, that’s likely the term that’s used when any food is cooked outdoors on a grill. So the meaning of barbecuing, when used as a verb, is actually the same as grilling in many places, but in the South people say ‘having a cookout’ or simply ‘grilling’. To Southerners, BBQ is smoked meat that has been cooked low and slow to achieve that perfect smoke ring. Many BBQ enthusiasts even scoff at putting sauce on their smoked BBQ because meat that has been properly smoked should be flavorful enough that it doesn’t need sauce. Choosing between smoking and grilling is purely personal. Many people like to have a grill and a smoker so they have options when it comes to cooking outdoors. If you have limited space, the grill is more versatile and can be used to cook much more than a smoker. If you’re creative with cooking and like to try new things, a smoker might be the perfect option. You can make your own jerky at home, and you even have the option to smoke cheeses and other foods that can’t be done on the grill. The outdoor enthusiast will also appreciate the smoker as you can bring home your freshly harvested meat or fish and smoke it at home. You also have the option of purchasing a HYBRID Gas/Charcoal grill which offers you the choice to grill with liquid propane or smoke or grill with charcoal. We have a page dedicated for these types of grills and show you the best hybrid gas/charcoal grills on the market. There are a few grills listed that are suitable for smoking meats (with charcoal) and/or grilling a quick steak. There is one unit we like, that is reviewed here on this site, which allows you to smoke and/or grill your meat… it’s up to you. It is the Smoke Hollow 8500 LP Combo Grill. Check it out, you might find it is what you need. Whether you’re grilling, smoking, or barbecuing your food this summer, it’s sure to come out tasty once you know a few basic techniques and recipes. Cooking outdoors during warm weather provides an excellent opportunity to enjoy spending time with friends and family in a casual atmosphere with great food. Plus, with this type of cooking there’s often less clean-up, a major plus when you just want time to relax without worrying about washing a bunch of dishes and cleaning up a mess in the kitchen. If you’re new to the outdoor cooking scene, there are many different books, blogs, or websites that can help you learn the basics and offer up some tasty recipes.